Whitworth Professor of Theology James Edwards' new book, The Hebrew Gospel and the Development of the Synoptic Tradition (Eerdmans, 2009), challenges traditional views of the synoptic gospels that, until now, were generally assumed to be true. He swims against the current of scholarly opinion by proposing that there was a Hebrew Christian gospel, which served as the foundation for the gospels that followed. "The single most important conclusion of my book is that an early Christian gospel, written in Hebrew, was widely known to the early church and was utilized by Luke in the composition of the Gospel of Luke," Edwards says. "The Gospel of Luke thus depends on two prior documents, the Hebrew Gospel and the Gospel of Mark, both known to us from antiquity." He continues, "The Gospel of Luke does not rest upon a hypothetical 'Q' source, which is an invention of Enlightenment scholars of the 19th century that is maintained still today without viable evidence. The effect of this Hebrew gospel is to ground the entire gospel tradition in sources known to antiquity, not invented in order to undergird modern prejudices." The "Q" source is traditionally regarded as approximately 220 mutual verses of Jesus' sayings found in Matthew and Luke but excluded from Mark, Edwards says. These verses include parables and other material, such as the Sermon on the Mount. The theory was first proposed by German philosopher and theologian Friedrich Schleiermacher in 1832, though it didn't receive the name "Q" for another 50 years. While the hypothesis is widely believed by laypeople and scholars alike, an intact copy of a "Q" gospel has never been discovered. In his research, Edwards found no concrete evidence of the Q hypothesis in primary Christian material. Edwards sheds light on the fact that Matthew and Luke draw on the Gospel of Mark, not a hypothetical "Q" source, for a great deal of material. Matthew and Mark share 600 verses; Luke and Mark share 350. Literary criticism shows Mark to be the donor gospel. In addition to Mark, Edwards says an exceptionally strong case can be made to support the contention that Luke utilized material from the Hebrew Gospel as well. Although scholars are unaware if a copy of the Hebrew Gospel has survived to modern times, Edwards cites 75 references to or quotations from the Hebrew Gospel that have survived in two dozen early Christian sources. The book goes on to provide further evidence in support of a widespread Hebrew gospel that was endowed with unusual authority and considered a primary source for the gospel of Luke. Edwards' research was sparked by two incidents that occurred while he was teaching his undergraduate students at Jamestown College, in North Dakota, prior to coming to Whitworth. 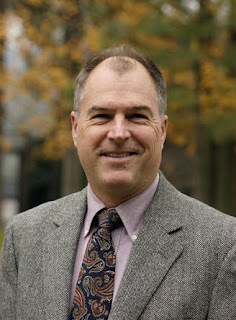 "In teaching a standard New Testament course, I realized that although I had researched nearly every aspect of the course on my own, when I lectured on the Synoptic Problem (why we have four gospels instead of one; and how the four gospels are related to one another), I was simply repeating what I had been taught, rather than what I believed to be true from personal investigation," he says. His second motivation came as a result of a 1986 study group he led in Israel, when he began to truly master the Hebrew language. This newfound understanding led him to realize that the Gospel of Luke is full of Hebraic echoes and backgrounds. "Since this book advocates a new theory on the formation of the first three gospels, and since most scholars are conservative and don't want to end up looking foolish in the eyes of their colleagues, I anticipate that initial scholarly reviews will be cautious, waiting to see how other scholars line up, both pro and con," Edwards says. Whitworth Professor of Theology Jerry Sittser says the serious questions about the Q hypothesis that Edwards' book raises will certainly make it controversial in scholarly circles, as many scholars have based their academic careers on the theory. He also believes Edwards' book will become a launching point for many new research projects in ancient Christianity and biblical studies. "This landmark study, a decade in the making, advances a bold and fresh interpretation of gospel origins that seems sure to generate interest, debate and controversy for some time to come. This is an important and exciting work that offers students an excellent introduction to early Christian views of the gospel tradition – and it gives synoptic scholars much to chew on." In addition, Edwards says two bloggers have written long, comprehensive reviews of his book that have been quite positive. "They aren't saying that my theory is correct, necessarily, but they do admit that it is built on a preponderance of evidence and they say that it's an argument that the New Testament guild can't neglect." In researching his book, Edwards says he has learned more than he could have possibly imagined. Along with having to read six languages other than English, he examined the gospels' oldest foundations. He also became intimately acquainted with German theology in the post-Enlightenment world, which he says has exerted tremendous influence on the formation of today's Western theology. "I have been pressed to examine and confess what I personally believe about this subject rather than simply accept what other scholars say about it," he says. "I have been forced to do what I also beg and plead for my students to do: to follow the evidence where it leads, and trust that all truth is God's truth." Edwards, a 1967 Whitworth graduate and ordained minister in the Presbyterian Church (USA), holds a Ph.D. from Fuller Theological Seminary and an M.Div. from Princeton Theological Seminary. He has also studied theology at the University of Zürich, in Switzerland, at the University of Tübingen, in Germany, and at Tyndale House, in Cambridge, England. Edwards joined Whitworth's faculty in 1997 after serving nearly 20 years as a professor at Jamestown College in Jamestown, N.D.
A contributing editor to Christianity Today magazine, Edwards has published numerous articles and books for scholarly and popular audiences. He is the author of Is Jesus the Only Savior? (Eerdmans, 2005), named the top book of the year on apologetics and evangelism by Christianity Today, and The Divine Intruder (NavPress, 2000). Other publications include a commentary on Hebrews in The Renovare Study Bible (HarperSanFrancisco, 2005); a commentary on Romans in New Interpreter's Study Bible (Abingdon, 2003); and a commentary on The Gospel of Mark, PNTC (Pillar New Testament Commentary) (Eerdmans, 2002). He is currently writing a full commentary on the Gospel of Luke as a means to elaborate, verse by verse, the global theory he developed in The Hebrew Gospel and the Development of the Synoptic Tradition. The Hebrew Gospel and the Development of the Synoptic Tradition can be purchased for $36 in hardback through the Whitworth Bookstore (509-777-3277). It is also available at http://www.amazon.com/. James R. Edwards, Bruner-Welch Endowed Professor of Theology, Whitworth University, (509) 777-3274 or jedwards@whitworth.edu.